The Kiwanis Club of Allen proudly sponsors the American Flag Program in the Allen, Fairview & Lucas TX area. 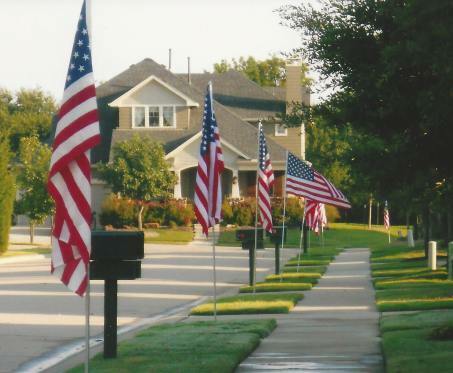 This is an opportunity for residents to honor our country and support our Armed Forces with a beautiful American Flag in their yard for seven (7) flag holidays a year. When you sign up, our team will install a plastic sleeve flush with the ground near the curb in the front yard to accommodate a pole mounted 3’ X 5’ flag (it will be capped and will not interfere with mowing). On the following holidays, the Allen Kiwanis Club Flag Teams will install the pole with the flag and then pick it up immediately after the holiday. Residents don’t have to do a thing! All proceeds from this program help our efforts with community non-profit organizations such as the Allen High School Key Club, Allen Community Outreach, Journey of Hope, Samaritan Inn, Children’s Miracle Network, Angel League Softball, The Dictionary Project for Allen ISD & Lovejoy ISD, and Terrific Kids programs at Allen ISD elementary schools. As a service organization of civic-minded citizens of Allen, the Kiwanis Club is dedicated to helping meet the needs of our community. Thank you for your support!